How enormous and diverse the genus Epidendrum L. is! It consists of about 1,100 species of orchids that are native to tropical and subtropical Americas and the Caribbean. Now though, it is widely distributed, naturalized and cultivated in many regions worldwide. The more popular and captivating species are the commonly named Crucifix Orchids. They produce large clusters of attractive flowers, each flower displaying a significant three-lobed lip, adnate to the column and resembling a cross, hence the common name. The blooms are so varied, absolutely stunning and uniquely gorgeous in many colors and form! 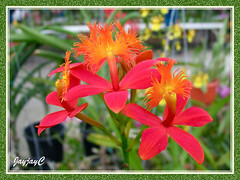 We first saw one with vibrant red blooms, Epidendrum cinnabarinum, in May 2007 at a local orchid nursery along the Rawang-Batang Berjuntai Road, about 50 km away or an hour’s drive from Kuala Lumpur. We were mesmerized but to purchase a flowering plant that costs RM150 is simply ridiculous. We were not prepared to dent our pockets for just a single plant, however tempting it be! Instead, a very young 8-inch tall plant was purchased after being convinced by the seller that it was of the same kind. And, it costs only one-tenth the price of the flowering plant! Almost two years down the road, when our orchid plant finally matured and flowered for the first time, it was an orange beauty instead! Aargh…we were duped! And, a note of thanks and appreciation to Dr. Neil Lancaster, RHS Botanist, Wisley for his kind assistance in identifying this epi hybrid for us. Plant type: Evergreen perennial orchid plants, native to Argentina in South America and extending northwards to Central America, Mexico and South Carolina in southeastern North America, as well as the Caribbean. 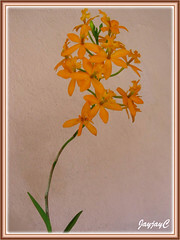 Features: With about 1,100 known Epidendrum species, it is inevitable that they are extremely diverse in many aspects. They are mostly found at elevations between 1,000-3,000 m and many, even lower or at sea-level. Hence, habitat is as varied, from humid jungles, dry tropical forests or hot lowlands to cool and damp alpine cloud forests. Most of them are epiphytes, though many are terrestrial species and a few lithophytes. Plant size differs greatly depending on the species, some are miniature to small, while others, medium to large. Most Epis have a tufted or caespitose growth habit, sympodial or monopodial in nature, producing mostly reed-like stems (hence referred commonly as Reedstem Epidendrums) or thickened pseudobulbs that are roundish or oblong like Epidendrum ciliare and E. stamfordianum. The slender reed-like stems may be simple and unbranched or branching, either erect, pendent, scrambling or creeping, with height (length) ranging between 30-150 cm or more. However, the newer hybrids are more dwarfish, compact and floriferous. Many stems have basal roots, others like the Epidendrum radicans have aerial roots along the length of the stem, and yet some others have plantlets emerging on older stems and flowering spikes. As variable is the appearance, size, shape, texture and color of the foliage. Blades are mostly green, leathery and ovate to narrowly elliptic or lanceolate. Leaves are held alternately along the cane-like stems, may be many or few, tightly or sparsely spaced. Psedobulbous species though, will typically bear only one, two or three green leathery leaves at the most. Undoubtedly, the flowers are also as diverse in appearance. Nevertheless, a typical distinguishable characteristic of an Epidendrum is the existence of a slit rostellum and has the lip adnate to a straight or slightly arched column, forming a nectary tube that continues through the pedicel. Mature stems will produce terminal peduncle (flowering spike) that may be short to long, and erect or slightly arching, with racemose or umbellate inflorescence that is sometimes corymbose, distichous or paniculate too. There are a few epis, like E. ilense and E. anceps that produce flowers on the same flower stem for several years. 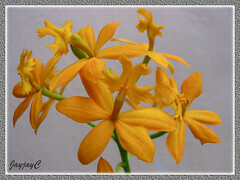 Epidendrum orchid flowers are small, of differing sizes, colors, shapes and structures. Colours include shades of white to pink, purple and red or yellow to orange, brown, green and others, some even bicolored, spotted or speckled. Flowers are cattleya-like, though much tinier (between 1.5-3.5 cm, or larger to 5cm or more) with 3 sepals and 2 petals that are nearly similar-sized, may be ovate to narrowly elliptic or linear in shape, acute or obtuse. Included is the characteristic central tubular column with the adnate lip (labellum) that may be entire or fringed but mostly tri-lobed, resembling a cross and aptly bear the common name, Crucifix Orchid. Flowers of some species, like E. radicans are resupinate while many others, such as E. secundum, E. fulgens and E. cinnabarinum are non-resupinate. Many species, such as the Crucifix Orchids or Reedstem Epis are prolific bloomers, with clusters of long-lasting blooms that open in succession over a long period of time or all at once, and flowering almost year round, though some flower seasonally or less frequently. Some species have inflorescence with many flowers, yet some less or few, and may be fragrant or not. 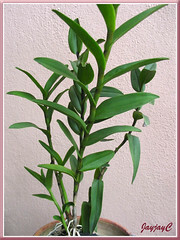 Epidendrums also produce typical orchid pods that contain many dust-like seeds. There is so much diversity among the vast species! 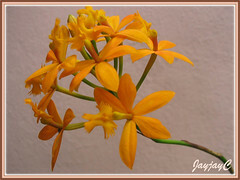 Do explore Jay’s Internet Orchid Species Photo Encyclopedia (IOSPE), and be astounded by the immense diversity of the genus, Epidendrum, with its numerous species divided into various groups according to their distinct characteristics. Light: Sufficient bright light or sunlight (even full sun) is paramount for their strong, robust and prolific growth, otherwise plants become weak, lanky and fail to bloom. Most epis appreciate intermediate to warm conditions, though several species growing at high elevation favour cooler clime and shady conditions. Moisture: Water well, regularly and abundantly during hot weather and especially during plant’s active growing period, keeping roots moist but not water-logged. Reduce water by allowing soil to dry slightly between waterings during flowering season or cooler weather. Knowing the type of water needed is beneficial. Some tolerate poor water quality, some do not and require rainwater or deionized water to thrive. Generally, warmer-growing species found at lower elevations are more salt-tolerant than cooler-growing species that receive pure rainwater at high-elevation. Epidendrums enjoy humidity and ample air circulation too. Soil: Potting media should be open and coarse, with emphasis on good drainage. Though tolerant of most soils, a potting mix of fir bark with any combination of coarse perlite, lava rocks, charcoal or gravel is ideal. Potting mixes can include tree fern, coarse sand, moss or coconut husks. Even just chunks of charcoal alone will do for epis planted in hanging baskets/pots…we grew ours in this fuss-free way! If ground-grown in the garden, use sandy loam soil. Others: Epis are heavy feeders, so fertilize them regularly with ample amounts during active growing period (less in winter) for stronger and healthier stems, foliage and denser inflorescences. Any balanced liquid fertilizer or a time-release one is ideal. Also, provide sufficient light for robust growth and flowering. To maintain tidiness and encourage new basal growths that are strong and healthy, remove old flower spikes and stems. However, pruning these are not needed for species that continue flowering on old and new stems alike for several years. Stake plants if necessary. Repotting is generally not necessary but advisable to replace the potting media every 1-1.5 years or repot when the plant outgrow its pot. Usually, no serious pests or disease problems, though do watch out for scale, aphids and mealybugs. For temperate regions: Hardiness: USDA Zones 8-11. 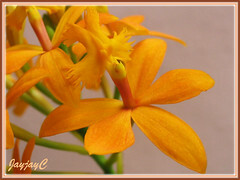 Epidendrum can tolerate a wide range of climatic conditions, may be warm, hot or cool. Some species can take light frost, near-freezing or extended-freezing conditions, like the only U.S. native, E. conopseum that is now known as E. magnoliae. But most would require frost-free conditions with minimum winter temperature above 50 F. Best with day temperature of 60-90 F and night 30-70 F. Recommended to overwinter plants indoors for frost affected regions and reduce water and feeding during winter. Read AOS article by Andy Phillips and Cynthia Hill for more in-depth information. Propagation: Easily propagated by division of pseudobulbous stems or offsets (new canes) that emerge from underground stems with a sharp knife. Occasionally, some Epidendrum species may produce pups (or keikis, the Hawaiian term for babies) on old stems and flowering spikes. These can be detached and potted individually as new plants once their aerial roots are 5-10 cm long. Usage: The taller Epidendrum species, especially the Reedstem Epis, are excellent for growing outdoors in raised beds or planters as background landscape plants. For a more spectacular and colorful display, plant variable colors of the same species in your garden beds for lingering delight. Crucifix Orchids are ideal as container plants for patios, decks, poolsides and porches. The epiphytic species will be great, mounted on trees, arbors or trellises and even potted in hanging baskets filled with suitable media like pieces of charcoal or coconut husk. The lithophytic species will be ideal for rockeries and xeriscaping, while the newer dwarfish and compact hybrids are suitable as indoor plants in brightly lit homes, offices and greenhouses. Reedstem Epidendrum with long-lasting blooms make excellent cut flowers too. Native: Columbia, Venezuela, Peru, Bolivia and Ecuador. Type: hot to cool-growing crucifix orchid, terrestrial or epiphyte, medium to large-sized, leafy reedstem. Flowers: small, 2.5 cm, flower stem 20 cm, sub-umbellate inflorescence, few to many-flowered, blooming in succession over a long period, colors usually white or rose. 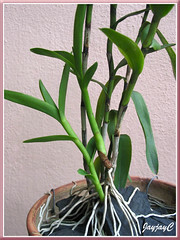 Type: hot to warm-growing crucifix orchid, terrestrial or lithophyte, medium to large-sized, sympodial reedstem (up to 1m tall) with green lanceolate leaves. Flowers: large and up to 6.25 cm, flower stem up to 180 cm, dense racemose inflorescence, few- to many-flowered, successive blooming over a long period, non-resupinate, mostly in shades of vermilion, ruby-red or vibrant red with tri-lobed lip in orange or yellow. Others: E. cinnabarinum and many of its primary hybrids are not tolerant of low temperatures (below 55 F) for extended periods. Native: Mexico, Guatemala, Belize, Brazil and other parts of northern South America, Trinidad. Type: hot to cool-growing crucifix orchid, terrestrial or lithophyte, large-sized, reedstem (up to 90 cm long) with elliptic-lanceolate leaves, vigorous grower. Flowers: large and up to 5 cm, flower stem up to 60 cm, racemose inflorescence, many-flowered, resupinate, fragrant, blooming almost simultaneously, colored yellowish-green with maroon specks and a white column and lip that is trilobed, deeply fringed and purple-spotted. Native: Sao Paulo, Brazil on the coastal regions at sea-level. Type: hot to warm-growing crucifix orchid, terrestrial in sandy soil, large-sized, erect and leafy reedstem. Flowers: small, 2.54 cm, long flower stem, racemose inflorescence, many-flowered, non-resupinate, blooming in succession over a long period, yellow-orange flowers with a glowing red-spotted yellow lip that gave its name which is derived from the Latin verb ‘fulgere’ meaning to ‘glow or shine’. Another distinguishable characteristic is the presence of a small keel in front of the column and flanked by 2 calli. Native: central to northern South America, including Brazil, Venezuela and Columbia. 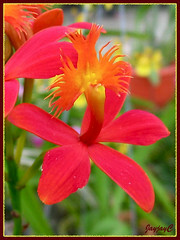 Type: hot to warm-growing crucifix orchid, terrestrial or lithophyte, medium to large-sized, leafy reedstem (up to 45 cm). Flowers: 3.25 cm, flower stem up to 35 cm or more (sometimes develop keikis on it), dense racemose inflorescence, many-flowered (can be up to 50 flowers), successive blooming (with 20 open at a time) over an extended period of time, non-resupinate, variable colors of reddish-yellow, orange, magenta, purple and others, floriferous year-round. Others: can tolerate freezing temperatures, but not below. Native: Mexico and southwards to Columbia and Venezuala. Type: warm to cool-growing crucifix orchid, terrestrial or lithophyte, large-sized, tall reedstem up to 60 cm long with ovate to elliptic leaves and develops roots all along the stem (a distinct feature), non-caespitose with a creeping habit. Flowers: small, 2.54 cm, flower stem from 25-50 cm long, racemose inflorescence, many-flowered, resupinate, blooming in succession over a long period, reddish-orange flowers with an orange-yellow lip, floriferous almost throughout the year. Others: can tolerate temperatures down to freezing. Flowers: medium, 3.75 cm, pendulous flower stem up to 60 cm long, racemose or panicle inflorescence, many-flowered, fragrant and long-lasting in a magnificent display, flowers are yellowish-green with maroon specks and a white to green lip or some other color combination, prolific blooming year round. Others: to grow, best mounted on wood or tree limbs and in partical shade. Native: not applicable. A cultivated plant, hybrid between two species, E. evectum and E. ibaguense, naturalized in Florida and Hawaii, with similar habit to E. ibaguense. Type: hot to warm-growing crucifix orchid, epiphyte or terrestrial, medium to large-sized, leafy reedstem hybrid. Flowers: 4 cm, flower stem up to 35 cm or more (sometimes develop keikis on it), dense racemose inflorescence, many-flowered, successive blooming over an extended period of time, non-resupinate, variable shades of red, yellow, orange, and others, floriferous year-round. How did you take care of it? concerning watering and feeding. But when I don’t fertilise them, they don’t flower. Hope you can share your thoughts on this matter. 2) once every 3-4 weeks, it’s fed with a few pellets of composted organic fertilizer. We use goat manure which is cheap and easy. Just throw a few pellets onto the surface of pot medium. Wow – 3 – 4 weeks, I thought you fertilise them weekly. I came across somewhere where is said weakly weekly.. and that had caused me to kill my orchid. But 3 – 4 weeks is like about one month once, thats a long wait for them to flower… really hope I got that much patience to wait for I had waited more than few years to see my reed orchid to bloom. I just got my new Epidendrum radicans today. I put it on my balcony and watered it. It has plenty of flowers. Should I water it every week? or twice a week? It is in full sun. 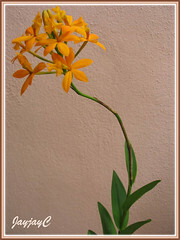 Are Epidendrum orchids’s poisonous if the flowers end up in our ground swimming pool in florida? Hi Sue! We’re as dumbfounded! About a month ago, our epidendrum bud also did the same “now you see, now you don’t” trick on us, like what you’re experiencing, and we don’t know why? How charming – I have a red one which reproduces with ease and is usually in flower. I would happily part with stems to anyone who asks – in fact, the more I ignore it, the more it grows. I would love to get hold of a yellow one! I just bought a “Ground Orchid Epidendrum” it has tall stems with multiflowers on lower stews of leathery leaves. I think you just need to snip off the whole flowering spike, Joy. The previous comment might be a little misleading – definitely not down to the bottom – only down to the leaves. :-) You might even experiment and leave the flower spike alone – what species/hybrid do you have? A few of them do reflower from the same spike. “Ground Orchid Epidendrum” is not quite enough information in this case. Is there any other tag stuck in the pot? We have a red Epidendrum for over ten years now, had it in a concrete pot out side and gave it no care we gave branches away to friends. The potting mix is standard and we have been watering with plant food just one so far we will see if it likes to be babied ! Please don’t think that we are bad people. I bought Mavis a Phalenopsis yesterday. Orchids are very fascinating don’t you think ? Thanks for sharing your epi experience, Donald. Indeed, orchids are extremely enchanting and we simply love their exotic and long-lasting blooms. Hi. Have just found your web site. And find the comments very usefull. I have a mouve epi. Which did not do a thing. It was small when I got it. And heard that they can be grown hydroponicly. With nothing to loose. gave it a go. And it’s growing very well. It has trebled in size. The mysteries of growing plants. Thanks for your generous comment of our website and sharing new insights in an alternative way of growing the epi. I live in se texas and received an orange epi and am now so hooked on these orchids but to my surprise they are hard to find. I thought when i had keikis we all could trade. I also received the dark pink and they are very very slowly growing, are some epi s harder to grow than others? My orange grew about 12 inches in a year and the pink nothinhg, but not dead. I have red and mauve-pink crucifix orchids flowering very well. I am worried that the mauve-pink one is turning red. Do they cross like that? Sorry, Beth…. we’re clueless. Hope someone else reading this may be able to provide you an answer. We acquired an orange epi from our daughter in Toowoomba and have now collected yellow red purple pink & mauve. A neighbor to my work has the same colours and said she had a white but it died for no apparent reason other than it never really grew. I’ve found our yellow to be slow also but it is making progress. My orange has slowed with age, still flowers well, but I suspect altitude and climate does play a role. The purple pink and mauve are prolific. Orchid potting mixes are great, large bark type, those in soil don’t do as well, a feed of seasol once or twice a month or a specific orchid feed mix sprayed onto foliage. And yes would love to find a white epi, are there any other colours out there in Australia? I have red, mauve and dark yellow epidendrums. The latter is a hybrid with very sturdy stems and larger flowers. It’s growing well but all the new stems are keikis. Is this because I didn’t trim back the spent flower stems? All my epidendrums are in pots in a hot N E facing situation, get watered every day and fed weakly ,weekly (usually).